Lennon, Markethill, Co Armagh, November 8th 2018, Peacefully at Daisy Hill Hospital, Newry, Surrounded by his Loving Family, Eugene (Owen) (RIP) Beloved Husband of Mary, and Loving Father to Patrick and Sheila. 22 Tannaghmore Road Mullabrack and Formerly 29 Bunker Hill. Eugene will Repose at His Late Home until Removal on Sunday at 10.15am to St Michaels Church Clady for 11.00am Requiem Mass, Burial afterwards in the Adjoining Cemetery. Our Lady of Knock Pray for Him. Very Deeply Regretted by His Sorrowing Wife, Son, Daughter, Grandson Dean, Brothers, Mickey, Seamus, Johnny, Aidan, Sister, Eileen, and Entire Family Circle. 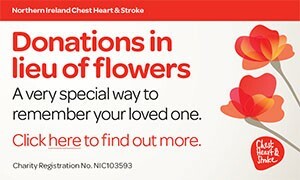 Family Flowers only Please, Donations in Lieu, if Desired for The Renal Unit, Daisy Hill Hospital, Care Of any Family Member, Donation Box in Home or Martin Kelly Funeral Director,10a Moore Island Road, Armagh Bt618LX. I am sorry to tell you that Eugene (Owen) Lennon has passed away.